Our mission is to provide every family a compassionate and personalized end-of-life experience that exceeds their expectations. Annual & Memorial Gifts - Consider making a difference with your donation during our annual giving campaign. A meaningful way to honor the memory of a loved one. Volunteer - Time is a valuable resource to our patients and their families. 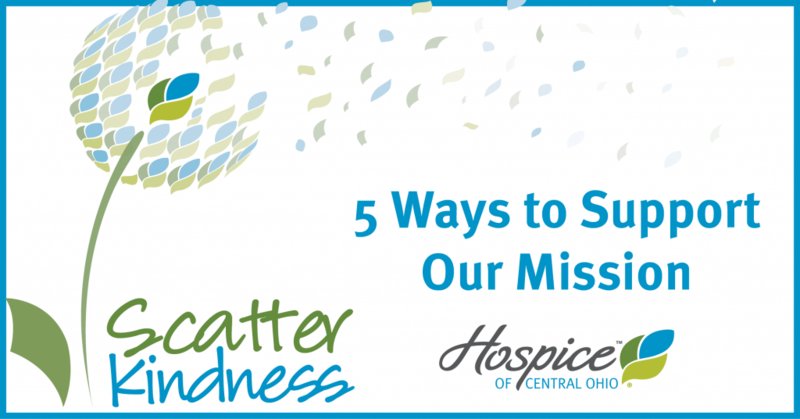 From friendly visits and flower deliveries to office support and data entry, every minute of volunteer time helps Hospice of Central Ohio deliver on its mission. United Way & Employer Match Programs - If you give to United Way, you can designate your charity of choice. In addition, many businesses offer matching funds when employees donate to charities. Invite Us - Invite us to speak at your group’s next meeting. We welcome the opportunity to let people know who we are and how we help. Attend Our Events - Proceeds from our events benefit patient care. See what's coming up here.